This project consists of the construction of an earthen levee, concrete floodwall, and construction of a storm sewer gatewell. The Phase 3 earthen levees and floodwalls will be constructed to an approximate river gage elevation of 44 feet and 45 feet, respectively. This project consists of the construction of a concrete floodwall, existing underground utility relocations and street reconstruction. 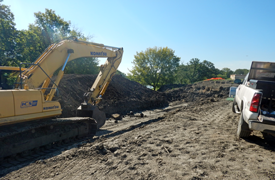 This project consists of 1,926 LF of new storm sewer, 4,000 SY of paving, gatewell structure, permanent levee, and 19,508 SF of architectural concrete floodwalls. ICS's portion of this project is the construction of approximately 520 LF of concrete floodwall, relocation of one gatewell, modification of existing gatewells and modification of an existing pump house. The existing transition structure was modified by demolishing the concrete walls and footings on either side of the structure. 4' x 5' openings were cut into 2 sides of the structure to allows the flow of discharge water to pass through the sides of the structure instead of the face of the structure. 160.5 cubic yards of reinforced concrete was placed to add 13' x 15'6" cast in place structures to each side of the existing structure. 120 LF of 8' x 10'6" pre-cast concrete troughs were attached to each new structure to allow the discharge water to flow out the sides of the existing structure into the new structures and eventually discharge out of the top of the pre-cast troughs and into a plunge pool. Additionally, 2 runs of 30" perforated HDPE were installed in the bottom of each trough section and various gradations of rock were layered over the 30" HDPE pipe to filter the discharge water before exiting the top of the troughs. 4" underdrains, a geosynthetic clay liner and rip rap was also installed between the trough sections where the final water discharged. 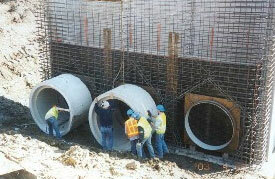 10' x 10' pre-cast concrete access manholes were installed a the end of each pre-cast trough section. Galvanized structural steel members and bar grating was installed in the existing structure and new structures. A new aggregate surface access road was constructed and the area was seeded. The existing outlet structure work consisted of designing and installing a sheet pile wall adjacent to a wetland area. 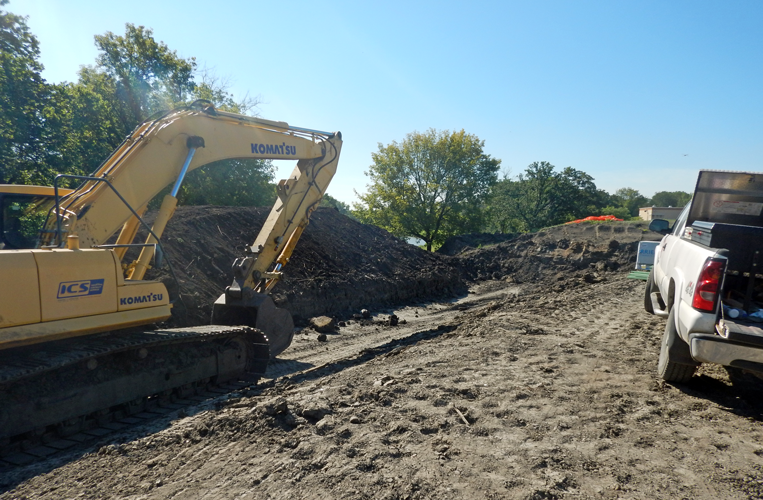 The sheetpile wall was installed 35' deep and 110' long and was installed from the upstream side so the existing wetland area was not disturbed. The upstream side of the sheetpile wall was then excavated, shaped, and approximately 4,100 square feet of articulated concrete cable mats were placed and grouted. Rip rap was installed around the perimeter of the concrete cable mats and the area was seeded. The difficult part of the project was that both structure modifications had to be substantially complete by May 1, 2010 with a contract award date of December 29, 2009. This required the majority of the work to be performed during the winter months. ICS received four prime contracts and one sub-contract for flood control projects in the Grand Forks, North Dakota and East Grand Forks, Minnesota area of the Red River Valley. The prime contracts were awarded through the US Army Corps of Engineers, St. Paul District. In 1997, the Red River of the North overflowed its banks devastating the sister cities of Grand Forks/East Grand Forks. Water levels exceeded the 100-year flood plain causing the mandatory evacuation of over 65,000 people. These flood control projects are similar in that they all required construction of new earthen levees, concrete flood walls, street closures and extensive re-routing of storm sewer and sanitary sewer water lines including several new large pump stations designed to blend with the existing residential homes, gate wells, junction manholes and drop inlets. 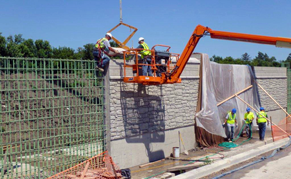 Over 11,000 linear feet of concrete flood wall was installed, often times in close proximity to residential buildings and other structures. Flood wall work also included several road closures and railroad closures that contained addition flood walls. Over 53,500 linear feet of earthen dikes were also installed using over 2,000,000 cubic yards of impervious fill and select impervious fill. All the projects required landscaping with numerous trees and shrubs, recreational areas including playgrounds, picnic shelters, restrooms, and miles of bike/walkway trails lining the levees. 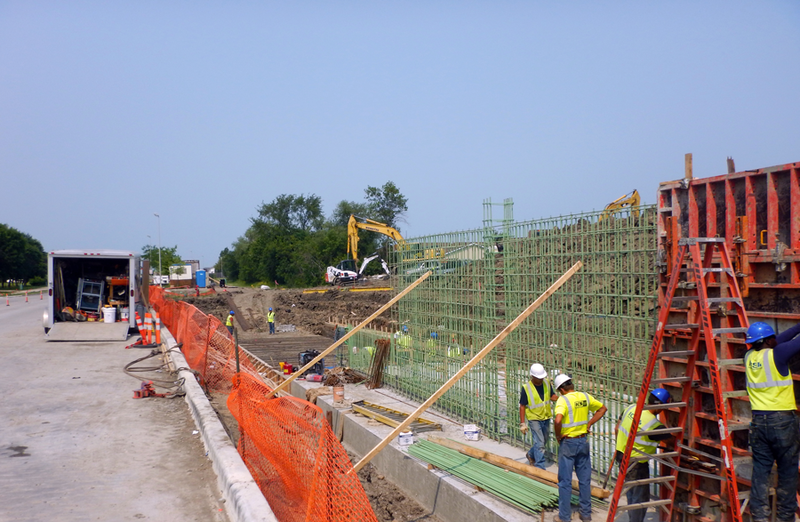 These projects required tight schedules due to the short North Dakota/Minnesota construction season and required working during the inclement winter months to achieve flood protection for the cities of Grand Forks and East Grand Forks. Temporary flood protection was implemented during the spring and summer floods during construction. The U.S. Army Corps of Engineers, St. Paul District presented the "2002 Contractor of the Year" award and the "2002 Excellence in Partnering" awards to ICS for their work on East Grand Forks Phase I Levees. The ND Ready Mix & Concrete Products Association presented Industrial Contract Services, Inc. with a 2004 Excellence in Concrete (Governmental Category) award for their work on the East Grand Forks Leeves, Phase II. 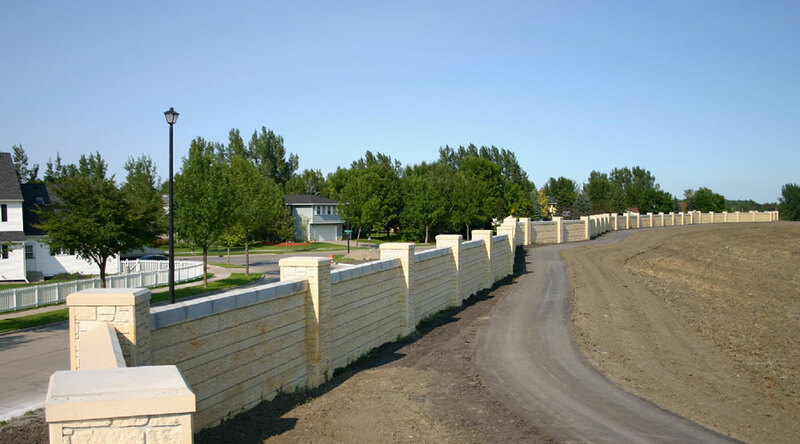 The ND Ready Mix & Concrete Products Association presented Industrial Contract Services, Inc. with a 2005 Excellence in Concrete (Governmental Category) award for their work on the Grand Forks Levee Phase II, Reach 2 Floodwall-Reeves Drive.